If you are searching for a professional camera unit then the most important feature that you require is probably 4K ability. 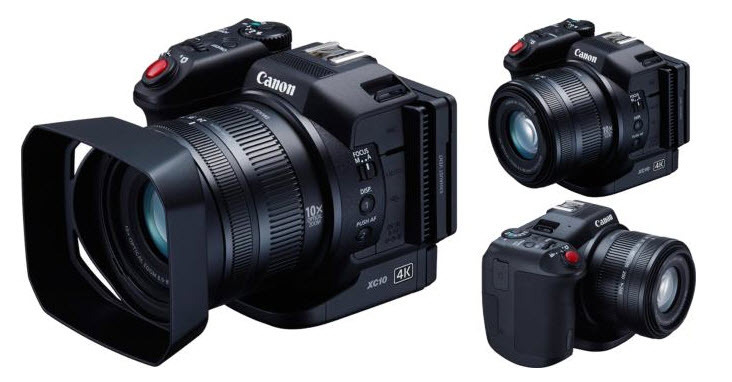 There are lots of 4K camera models available in market but if you need lightweight, portable as well as compact- all features at once then Canon XC10 is best option for you. This advanced camera unit captures high quality stills at 12MP rating and you will find a stunning blend of all new features inside this camera unit. If you are planning to make a new investment of high quality digital camera unit then probably XC10 can serve your needs best. Impressive image stabilization that leads to much effective results for HD modes. The built in type lens provides 10 times zoom ability. This digital camera is compact and lightweight. You will find its limiting lens little bit troublesome. Although 4K recordings can be easily saved to CFast 2.0 cards but for slow motion videos and simple HD collections you will need a SD card. It does not support XLR audio input signals. There are lots of unique things to talk about XC10. Let us start with viewfinder and lens hood that make this camera unit more distinctive. This impressive 4K camera is well known for its light weight construction and compact shape that becomes best choice for professionals who often wish to take cameras for field recording. You will definitely love its freestyle hand grip and there is a user friendly button layout on the device that assists in easy adjustments of essential settings. You will find all its controls in reach of your finger with easy to access buttons and it can be easily wrapped around fingers with sturdy handgrip. You can use CFast 2.0 cards for 4K recordings that work at 305 and 205 Mbps whereas for simple 1080p recordings 35 to 50 Mbps is enough. XC10 has a RC-6 remote control with wireless ability, viewfinder for LCD and lens hood. This digital camera unit possess one 10x optical zoom lens; when camera is operated in video mode then this lens offers 27 to 273 mm focal range. Note that, this lens is variable aperture type where you will be able to access f/2.8 aperture range at widest focal length but when camera is fully zoomed out then aperture falls to f/5.6 range. Few professionals find this feature quite annoying because most of digital cameras work with f/2.8 aperture range when they are completely zoomed out as it leads to smooth creamy background. Probably, you have to make little compromise for your zoomed collections with this camera. You will be happy to hear that XC10 can capture crisp images but you will definitely miss the raw collection options. It not even has a dedicated view finder so its shooting process appears quite different as that of mirror less cameras and DSLR units. It comes with a small 1” sensor that decays its performance in low light conditions. Probably, you can find all good features with satisfactory performance in mirrorless cameras and DSLRs of same price range. Most of the professionals as well as beginners buy advanced digital cameras to enjoy incredible video shooting abilities. You can enjoy great response from XC10 at both 4K settings as well as for 1080p resolution level. Filmmakers will be sad to know that this camera can provide you only Ultra HD 4k recording as it misses the full cinema DCI capability. If you are a crazy video recorder and love to work on both 4K as well as 1080p settings then you need to add little more efforts for storage management. Actually, the fact is that the CFast 2.0 slot can handle only 4K recordings whereas the SD card unit can work only for 1080p resolution so you need to switch between them every time when you have to change your shooting mode. Further, in case of 4K recordings you will be able to set frame rates to 30 fps whereas for 1080p setting you can fix it up to 60fps only. In case if you are thinking to capture slow motion videos then simply move to 720p setting and adjust frame rates to 120 fps. It can capture stills at 12MP but JPEG only. Professionals can make easy adjustments for fast motion and slow motion recordings. Canon log is added that allows 12 stops for dynamic range. It can record 4K UHD videos having XF-AVC feature on to CFast 2.0 cards. Tracking auto focus and Face detection mode. Fixed 10x zoom lens that works with image stabilizer. Digic DV5 advanced image processor. However, due to the unsatisfactory low light performance and small sensor unit, this camera may not appeal professional filmmakers but still all other incredible features of XC10 make it stand out against several competitors in the market. It ensures high quality 4K UHD recording with wide range of picture modes that allow easy adjustments for quality. The adjustable touch screen monitor helps in easy access of controls. You will definitely love its response for slow motion and fast motion collections but prefer to keep CFast 2.0 and SD Card both in your pocket to enjoy uninterrupted recording. Thank you for this post. I just ordered the XC10 and am awaiting delivery.